(1). The shuttle takes you from the "Orsay Le Guichet" RER B station to the residence from Monday to Friday (reservation required). Information and reservation at the residence. Located on the Saclay plateau just 25km from Paris, the Bures la Guyonnerie extended stay hotel guarantees you high quality accommodations that are friendly and comfortable in a very contemporary setting. Bures-sur-Yvette is located in the heart of the Chevreuse valley in an exceptional natural forest environment. Many pedestrian paths let you roam around its wooded hillsides and appreciate the quiet setting. 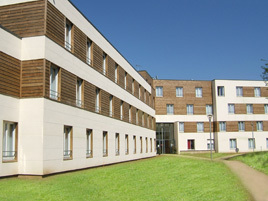 The town is best known for its institutions of higher learning and research such as the Institut des Hautes Études Scientifiques (Science Institute) and a part of the Paris-Sud (Paris-South) University campus. You can also explore the Parc Naturel régional de la Haute Vallée de Chevreuse (Chevreuse Valley Regional Natural Park) with its rural character. The extended stay hotel has furnished and fitted-out studios and 1-bedroom suites, which include a living room with a convertible sofa that sleeps two, or two convertible armchairs, a flat-screen television with satellite, an office area, a fully-equipped kitchen (glass ceramic stovetop, dishwasher, refrigerator, microwave, dishes…), bathroom. Reception is open 7 days a week and you are offered services such as free wifi internet or parking and laundry facilities for an additional fee. What's new: a shuttle service takes you directly from the 'Orsay Le Guichet' RER B station to Residhome (reservation required and subject to availability. Information, schedules and reservation at the residence).